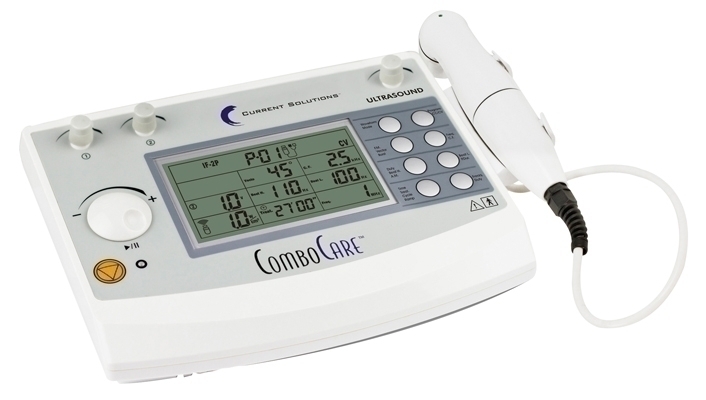 The ComboCare" microprocessor controlled unit combines clinical ultrasound therapy with five treatment waveforms: IF 4-Pole, IF 2-Pole, Russian, EMS and TENS. Large easy-to-read LCD panel allows the clinician to quickly set up treatment parameters. A dual frequency 5 cm sound head comes standard with the unit. Provide ultrasound and e-stim simultaneously, great for treating trigger points. 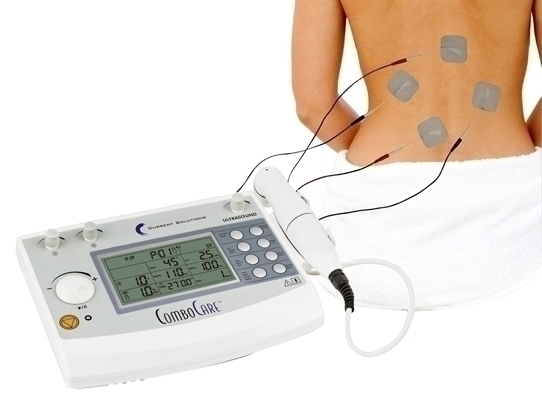 Two channels of electrical stimulation output. Large easy-to-read graphical LCD display with exact dial performance and programmable timer. Waveforms include TENS, EMS, 2-Pole Interferential, 4-Pole Interferential and Russian. Dual clinical ultrasound features a 5 cm2 sound head which offers 1 MHz and 3 MHz frequencies. Ultrasound has 10% - 100% duty cycle selections. 10 presets per waveform. 20 ultrasound presets. User defined memory positions for user protocols. Designed for tabletop, therapy cart or mobile use. Includes eight sets of electrodes, eight sets of rubber electrodes. With sponges, eight straps, four sets of lead wires and a user manual. Notice: Typically ships in 1 week. This item can only be purchased by or on the order of a physician or other practitioner licensed to use or prescribe this device. Resellers must only sell to a buyer who meets these qualifications.